Ceramics form a major part of Turkey's artistic tradition. The development of tile and ceramics art began as early as 11th century. During the 15th and 16th century Iznik developed into a prominent center of production supplying decorative tiles for the new palaces and mosques of Istanbul. 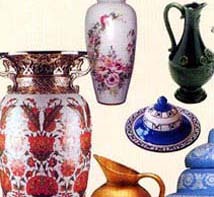 Today both traditional types of ceramics and modern pieces are produced in Iznik, Kutahya and Canakkale.